This mini desk stand can provide a safe and secure mount for your smartphones and tablets, vertical or horizontal. Now it is time for you to give your hands a break, and enjoy videos, readings, facetime, browsing the web and other handsfree operation. From 0° to 100°, you can adjust to your preferred angle among 10 different viewing angles, and watch videos in a more comfortable position. It is easy to operate, and just push the rear panel to a desired angle. Made of premium solid ABS material, thickness: , making it sturdy and secure. The built-in steel spring can withstand folding above 10,000 times. The one-piece, foldable design makes for added convenience when carrying in a bag or otherwise on the go. PORTABLE SIZE – 85mm*95mm, it is foldable and easy to slip it into your pocket. MATERIAL – Superior ABS and rubber pads on the bottom to protect the stand from sliding. MULTI ANGLE – Directly adjust to your preferred angle among 10 different viewing angles, from 0° to 100°.Holds your samrtphone or tablet in portrait or landscape mode safe. 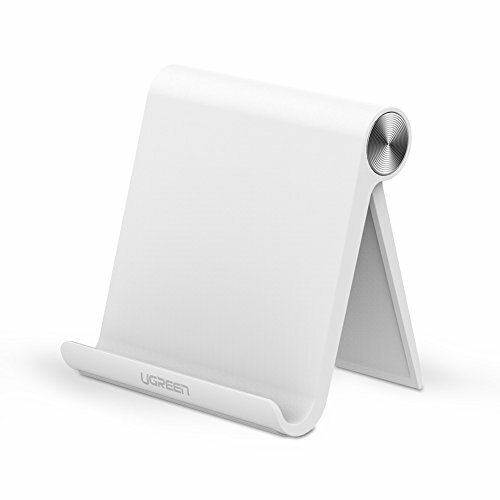 USE – Ugreen Multi-angle mini desk stand can hold your smartphone or tablet at a comfortable angle, which is ideal for watching videos, reading, video recording, or simply browsing the web, facetime or handsfree operation. UNIVERSAL COMPATIBILITY – Works with all 4-10 Inch smartphones, tablets and e-readers, such as iPhone 7,7plus,6s, iPhone 6s plus, iPad mini, iPad Air, Google Nexus 4/5/7/10, LG G2/G3, Galaxy S7/S6/S5/S4 Mini/S3/S3mini, Galaxy Note 2/Note. Very Cute and Very Sturdy Phone Stand! This is really a nice, sturdy phone stand which can be adjusted to any desired angle we prefer. It is very light yet very sturdy and I can carry it with me in my purse which is a big plus. My sister-in-law and niece saw this stand, asked me where did I buy this from. The colors the seller offer are awesome pastel colors which are really attractive. Purchased this product at a full price, however I am very happy and very satisfied with this purchase. Highly recommend this product! So worth it What a fantastic phone stand.. Heavy and quality made. You can adjust the angle. It has silicone on the front edge to avoid slippage. Color you see in the ad is true color. It is well balanced so no matter which way the phone is placed, it stays in place solidly.